A really fun day trip to take if you're staying in the Honolulu and Waikiki area is a trip over the Pali Highway to Windward Oahu. Along the way, you're sure to enjoy the wonderful scenery as you make a few stops that you'll really enjoy. Heading over the Pali Highway (61), in Honolulu, which you can access from either Ala Mona Blvd. 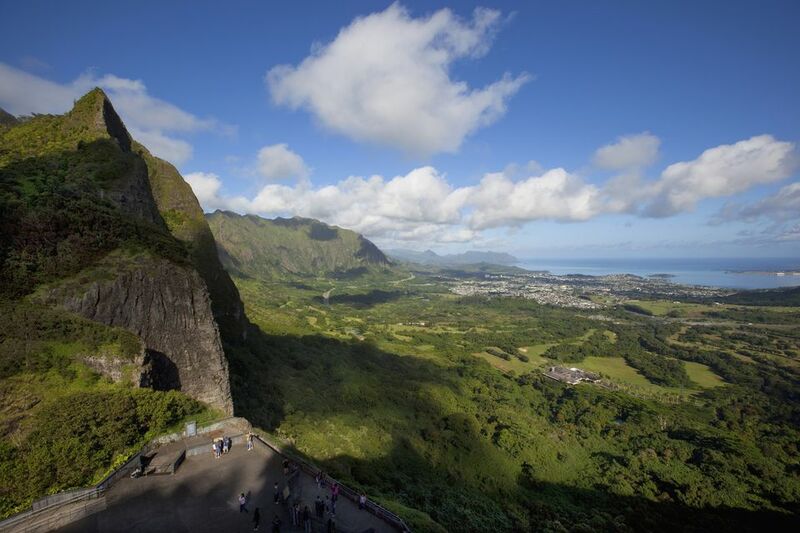 or the H1 Highway, your first stop should be the Nu'uanu Pali Lookout. Admission is $3.00 per car. (From the lookout you'll get fantastic views of Windward Oahu from Kaneohe Bay all the way to Chinaman's Hat (Mokoli'i Island). It's a windy place, so watch your hat. You might want to bring a light jacket since it can tend to be chilly. The Pali Lookout is the site of the Battle of Nuuanu, where in 1795 King Kamehameha I won the struggle that finally united Oahu under his rule. This fierce battle claimed hundreds of soldiers’ lives, many of which were forced off of the Pali’s sheer cliffs. Get back on the Pali Highway and continue eastward towards Kailua, the largest town on this side of the island. If you have time, you can stop in Kailua on your way back in the afternoon. Watch for signs for the Kahekili Highway (83) and stay on it through Kaneohe, making sure to take the left-hand jog when you get to the Likelike Highway (63). Continue north for about three miles and turn left into the Valley of the Temples cemetery where you can follow the signs to the Byodo-In Temple, which is located in the back of the valley. Built in the 1960s the temple is a replica of the 950-year-old Byodoin Temple located in Uji, Japan. Fans of the TV series Lost will recognize this beautiful site. There is a small entrance fee of $3.00 per adult, but it is well worth it. This is one of the most scenic locations on the island, so be sure to have your camera handy. Allow yourself about an hour to explore the temple and grounds. As you leave the Valley, make a left back onto the Kahekili Highway (83) and continue north. The highway's name will change to the Kamehameha Highway. You'll be heading about 9 miles north with the Ko'olau Mountains on your left and the ocean on your right. You'll first come to Kualoa Regional Park. If you have time, pull into the park and walk across the expansive lawn to get great views of Chinaman's Hat (Mokoli'i Island). Getting back on the highway, it's only a few seconds until you'll see the entrance to Kualoa Ranch, on your left. This will be your principal destination for the day. Kualoa Ranch, now also referred to as Kualoa Private Nature Reserve, is one of my favorite places on Oahu. The ranch owns two adjoining valleys all the way to the ocean, the Hakipu'u Valley and Ka'a'wa Valley. The ranch has been used as a filming location for numerous TV shows, including Lost, the new Hawaii Five-0 and Last Resort as well as many motion pictures including Jurassic Park, Jurassic World, Godzilla, Pearl Harbor, 50 First Dates and Windtalkers, to name just a few. Kualoa Ranch offers a number of tours and activities, including a Movie Sites and Ranch tour, a Jungle Expedition Tour, an Ancient Fishing Grounds & Tropical Gardens Tour, ATV tours and horseback rides. The tours fill up quickly, so you probably should make reservations in advance. You can probably arrange to do two or three tours while you're at the ranch. Many of the tours are less than $25 each for an adult. If you're not interested in the ATV or horseback tours, be sure to do the Movie Sites and Ranch tour. They now also offer a new Treetop Canopy Zip line tour that has 7 zip stations ranging from 200 feet to a quarter mile in length. If you have time still left in the afternoon, I recommend that you take time to visit Kailua Beach which will be about 17 miles and 30 minutes south of Kualoa Ranch. Make a right turn as your exit the ranch's driveway and head back south on the Kamehameha Highway (83). After about 10.5 miles there is a slight jog to the left when you reach the Likelike Highway (63). After about a half mile, make a right back onto the Kamehameha Highway (83). In a little over 2 miles, you'll be back at the intersection of the Pali Highway. Make a left on what is now called the Kalanianaole Highway (61). This road will lead you into downtown Kailua where the name changes to Kailua Road. If you'd like to visit Kailua Beach, be sure to note that Kailua Road makes a right turn in downtown Kailua. If you stay on the road, taking another left-hand jog, you will come to Kailua Beach Park. Kailua Beach is one of Oahu's most beautiful beaches and well worth a visit. In 1998, Kailua Beach was named Best Beach in America by Dr. Stephen P. Leatherman a.k.a. Dr. Beach. Once so named, a beach is retired from future competitions. From Kailua Beach Park you can take a ride through the exclusive area of Lanikai. The road into and out of Lanikai is located at the southern end of the beach. The road is a one-way loop, so it will take you right back where you start. Lanikai has some of the most beautiful and expensive homes on the island. Lanikai Beach was chosen as Best Beach in America in 1996 by Dr. Beach. The views of the small Mokulua Islands is best seen from the beach. When it's time to head back to Honolulu or Waikiki, all you'll need to do is retrace your route through Kailua and head back over the Pali Highway. That's a lot to see and do in one day, but it is possible. Get an early start and plan on a long day, but it's one, I'm sure, that you will always remember. Before you go, be sure to bookmark our Google map of this trip for your reference as you drive. Book your stay in Waikiki or the Kailua/Lanikai area of Oahu with TripAdvisor.